Note how many of the street names are Swedish. The old architecture, too. Gustavia, the nation’s capital, is one of the prettiest ports in all the Caribbean, as the following walking tour around the harbor will demonstrate. Gustavia,however, is a strange name for such a decidedly French island. It's due to the island's checkered history and the various countries that claimed it. Gustavia was named after a colonial Swedish king during the period Sweden owned the country after France sold the island to the Swedes in 1784. The French bought St Barts back 94 years later, but by then the streets had Swedish names and the architecture was also Swedish. 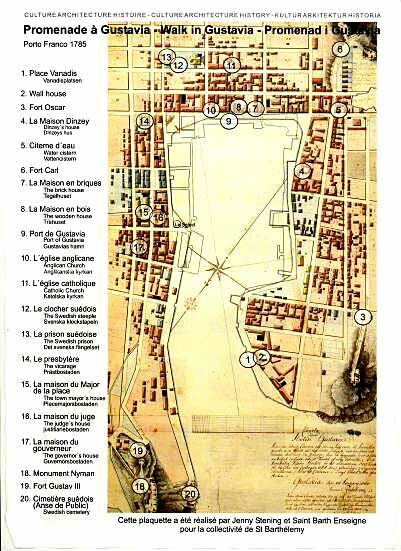 Below is a map from 1785 showing the city's major landmarks. Except for Fort Oscar (#3),the Swedish prisons (#12, #13) and Fort Gustav (#19), they survive today.